You won't have to pay an annual fee† Same page link to Pricing and Terms for all the great features that come with your Freedom Unlimited® card. Already have a Chase Freedom Unlimited® card? 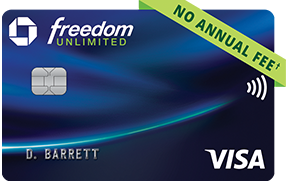 Get $100 cash back for each friend who gets the Freedom Unlimited® card. Great card for everyday purchases and racking up bonus points! Excellent customer service, awesome reward points, very good fraud protection, one of the best cards ive ever had. Would highly recommend. Best Credit Card Out There! What's not to love about about this card!? Easy balance payment, cashback on all transactions that you can redeem easily at any time, no annual fees. Plus my credit limit doubled after the first 6 months! Love this credit card. Before we approve you for a credit card, we will review your credit report and the information you provide with your response to confirm that you meet the criteria for this offer. Based on this review, you may receive a Visa Signature card or Visa Platinum card with different costs and/or benefits, or you may not receive a card. For pricing details, please see Pricing & Terms. For benefits details, please read your credit card benefits materials which will be mailed after your account is established. Cash Back and Points: "Cash Back rewards" are the rewards you earn under the program. Cash Back rewards are tracked as points and each $1 in Cash Back rewards earned is equal to 100 points. You may simply see "Cash Back" in marketing materials when referring to the rewards you earn. How you can earn points: You'll earn points when you, or an authorized user, use a Chase Freedom Unlimited card to make purchases of products and services, minus returns or refunds. Buying products and services with your card, in most cases, will count as a purchase; however, the following types of transactions won't count and won't earn points: balance transfers, cash advances and other cash-like transactions, lottery tickets, casino gaming chips, race track wagers or similar betting transactions, any checks that access your account, interest, unauthorized or fraudulent charges, and fees of any kind, including an annual fee, if applicable. 3% Cash Back per $1 spent on all purchases until the earlier of the end of your first year or first $20,000 spent: You'll earn 3% Cash Back rewards for each $1 spent on all purchases made within your first 12 months from account opening, or until you reach $20,000 in purchases, whichever occurs first. The 3% Cash Back rewards will appear on your statement as follows: 1.5% Cash Back rewards plus an additional 1.5% Cash Back rewards for each $1 spent on all purchases. After that, you'll earn 1.5% Cash Back: You'll earn 1.5% Cash Back rewards for each $1 spent. How you can use your points: You can use your points to redeem for any available reward options, including cash, gift cards, travel, and products or services made available through the program or directly from third party merchants. Redemption values for reward options vary. Points expiration/losing points: Your points don't expire as long as your account remains open, however, you will immediately lose all your points if your account status changes, or your account is closed for program misuse, fraudulent activities, failure to pay, bankruptcy, or other reasons described in the terms of the Rewards Program Agreement. Delivery of alerts may be delayed for various reasons including technology failures and system capacity limitations. There is no charge from Chase, but message and data rates may apply.